The Mikoni crept across the Yguni plateau while her village was asleep. Their medicine man shrouded them in the mist. But Nyira’s father, Ahmed, could smell the mist men in his sleep. He awoke. “Get up child,” he whispered to her. Nyira loved how her father appeared in her dreams, as a butterfly or a raindrop, or as the wind. It was his way of not startling her from her sleep. Such an act could damage a child’s spirit and fuel nightmares. This time he was himself: tall and lean, wearing his blue cotton sleeping robes. A shadow rose behind him. “Papa…?” When she sat up, she heard people running and screaming. She rushed to the door of her hut and saw some of the village structures were ablaze. She ran to the well at the center of the village and almost couldn’t get through. All her people were pushing and fighting past the square, trying to escape the fire and the Mikoni. Her only thought was to get to her father. When she finally broke through, Gnangi, the chief’s massive wife reached out and caught her by the arm. “No, Nyira. We must leave,” she snatched the seven-year-old up and tucked her onto her hip. Nyira was enveloped by Gnangi’s coconut oil aroma as she disappeared into the folds of her Kente robe. “Please Gnangi! Papa woke me from my dream, and there was a shadow behind him.” She kicked and squirmed. Nyira turned and fled down the path to the jungle. She felt the warrior’s footsteps as he pursued her. “Don’t make me chase you, girl,” he snarled. “I will be angry if you make me chase you!” The heat of him was on her back, and just as he lunged to grab her, she darted into the darkness of the bush. He wouldn’t follow her there. No one went into the jungle at night. Not even warriors. They hunted there during the day, and the women of her village collected the banana and coconuts and other fruit from its many trees, but they always left before sundown. Only Nyira, the medicine man’s strange daughter, who had no mother to teach her better, ventured into the hot teeming blackness. She stopped about thirty yards into the foliage. The warrior had stopped as well, right at the edge of the darkness. “The jungle is not safe for a child,” he said. “Come out girl.” He sounded almost pleading. Nyira wasn’t listening, and the blur of her tears made the village’s burning huts appear distorted. Where was Papa? Why couldn’t she hear his mind? She stood still and closed her eyes. An image appeared to her—though it wasn’t very substantial. It was as if her father had turned into a kind of smoke like she was dreaming. This was no dream. He wore the cream-colored garments he preferred when traveling in the spirit realm. When she came out of her trance, the warrior held her in his embrace. His smell was sweaty with a thick musk she knew was fear. “You didn’t go far enough, girl. Now you will pay—” Something bumped him. It was huge but smooth, and there was more than one. He looked around him; his eyes got wider. Nyira watched the warrior’s face in the darkness—she had moon vision. That’s what her papa called it, so she only needed a minute amount of light to make out his expression. He had beautiful eyes, not the green of a sorcerer, a light hazel. Like Gnangi or some of the other women of her village. The big thing bumped him again. The warrior’s musk got stronger, and the sweat of his brow fell onto her face like large raindrops. “Let me go!” she told him, kicking and wriggling. “No…you…you are mine. I will—” The thing hit them harder, and knocked him off his feet. She broke away then. But he stood, breathing fast as he reached for her. “What…? What was—” The thing smacked him again. It knocked him flat. “I—stop! Stop it!” He jumped up, took out a knife, and slashed at the darkness. His sweat glistened in the moonlight. The thing let out a low booming growl. The warrior backed away, trembling. He then turned his head toward the opening at the edge of the jungle, and Nyira could see he thought there was a chance. “Don’t run,” said Nyira. He wasn’t listening. “You won’t—” He bolted for the clearing. He barely made five steps and was ripped back into the blackness. They tossed him around, like a straw ju-ju doll. “Help me!” he screamed. “”Stop it! He—” Nyira turned her head away. She heard him make a gurgling sound from his throat, then nothing. She turned and moved further into the jungle, but the thing bumped her now. She smelled the warrior’s fear on it. There was a rumbling moan, so deep it vibrated the ground, and then a huff. She reached out and touched it. A heavy, muscled form rolled itself around her. Aboo, she admonished. You were bad. Brothers see run, grumbled Aboo. Should not run. It not moving. Can have it? Nyira fought back tears thinking about Gnangi lying face down, with a spear in her back. Yes, she said. Take him. After her encounter with the Mikoni warrior, Nyira stayed up in the mahogany trees. The monkeys tried to bring her fruit, but she couldn’t eat as she gazed at the remains of her village—so they cried with her and did all they could to ease her grief. Nyira wanted to ask: where is my papa? But kept the thought to herself. After the Mikoni had left and her village was deserted, she went back to search the men’s lodge. She never made it that far. The hyenas got to the village first. She’d seen what they did to a water buffalo that died along the banks of the river. She only got as far as Gnangi’s body. Nyira let out a scream that scattered the hyenas and then ran back into the jungle, howling in sorrow. She did that for the rest of the day. The other creatures of the bush must have wondered what type of animal howled while the sun was up. She spent the next few weeks mourning and sleeping on the backs of Hippos near the bank of the Congo River. At one point, the bonobos coaxed her into a game of catch the monkey-fruit, but she never mustered the enthusiasm they were hoping for. The Mikoni returned to her village—a few times during that period. She never showed herself, and had no plans to give herself up, not yet. The big man in thepagne was always with them. One morning, as she roamed the forest, a banana dropped from the tree above. She looked up and saw a young gorilla dangling from the vine in the tree above her. “I am called Nyira. And I have no mother.” She picked up the fruit and tossed it back to him. “I must find my courage. Father says I must learn to be brave—or I will not win a breeding group. But I have an idea that will make mother happy.” He dropped to the ground. “Come. Climb onto my back. We will go and meet mother.” Nyira was apprehensive, but still intrigued, so she hopped onto the ape’s back, and he climbed back into the tree and sprang quickly from branch to branch until they reached his home. It was deeper into the jungle, but still not far from her village. Gord’s mother, Nje, sat sullenly near a copse of Mahogany trees in the clearing. His older brothers, Dyil, Biko, and Djat, were performing feats of strength to lift her spirits. Dyil, the eldest, picked up a small boulder. “Look mother! See how far I can throw this!” He heaved the rock a good distance across the field. Nje hardly noticed the display. She smiled when she saw her youngest drop from a tree with something on his back. “Look mother!” cried Gord. “I bring something to cheer you.” He stopped in front of the sad-eyed old female and Nyira climbed off his back. “That is a human!” roared Dyil, charging up as if he might trample Nyira. “You cannot bring a human here!” Nje approached Nyira very slowly, as though afraid to frighten her. “Why is there a human here?” growled the big male. “My youngest has found a tiny for me to hold.” Mogi turned his gaze upon Gord, and the youngster almost fled. “I want to hold her, Mogi,” whined Nje, she was crying. “She is so small and has no one. Can I not hold the tiny one?” Mogi looked upon Nyira as she sat quietly on the grass in the clearing. Nje clenched her arms to her chest and rocked back and forth, as she made a groaning sound in her throat. “Do not make the mothering sound at me! I didn’t take your child! I—all right! But keep it out of my nest!” He snatched a medium sized gum tree up by the roots and hurled it past Dyil’s stone. For the next couple weeks, Nje toted and groomed Nyira like a small child. She realized that this couldn’t possibly go on forever, but enjoyed the attention, and needed it almost as much as Nje. The older males kept their distance. Nje threw coconut shells and sticks if they got too close. One evening Mogi made a decision. “We must leave this valley. The humans are searching for the tiny tiny. They will attack if we stay here. Tomorrow I will go find a place deeper in the forest. You must all remain concealed until I return.” The younger apes took to the trees. But Nje had some tasks to complete before the journey. “If you put me down, I can help,” said Nyira. “Are you strong enough?” She handed the girl one coconut. “I could maybe carry two.” Nje looked suspicious of this claim. Gord and his brothers left the clearing for a Monkey fruit tree at the edge of the valley. At night, while Nje was asleep, Nyira and Gord leaped and cavorted through the trees. To make sure she could keep up, Gord had Nyira ride on his back. “I didn’t have a sister, either,” replied Nyira. “But I played with the girls in my village. When their mothers allowed it. That changed when I got older.” Gord led her to secret berry bushes that even his brothers and father were not aware of. They made sure to get back to the band before Nje awoke the next morning. On the following day, when the young males left the clearing, Nje put Nyira down and went about her final tasks before the journey. Suddenly a leopard rushed out of the high grass and pounced on Nyira. When it closed its jaws on one of her little arms, it received a jolt of pain. Nyira broke free and ran for the trees. “Run Nje!” she cried. The leopard recovered and was quickly on her tail. Unfortunately, Nje showed no regard for her own safety. She ran straight at the leopard. “Not my tiny tiny!” she screamed, flinging sticks and coconut shells. The flimsy debris bounced off the cat; and it paused briefly, as it focused on a much larger prey. That was the moment Nje seemed to realize the danger she was in, and turned, trying to get away. The leopard jumped on her back. She flung it off and kept running. The leopard was quicker than the old ape though, and cut her off. Cornered, the gorilla displayed her considerable fangs and swatted at the cat. The cat swatted back, tearing out her right eye and a good part of her jaw. Nje took off again, only in the wrong direction—away from the trees. The cat jumped her again, sunk its teeth into the back of her head, and dragged her off her feet. By the time Gord and his brothers responded to the sound of their mother’s cries, she was dead. Nyira hid in the bush and sobbed. Her first instinct was to run away, fearing herself pulled back into despair. She fought against it for the sake of Gord. She climbed into the trees with Gord and the rest of his brothers watched, as the leopard dragged the body of Nje under a nearby sycamore, and fed. “Don’t look,” Nyira told Gord. She took her own advice and kept her eyes closed. She periodically stole a peek at Dyil. Nyira sensed he was hurting, but he would never allow his brothers to see him cry. “Shut up!” said Hjat. He smacked his younger brother across his nose. “You know nothing. You speak when you’re asked.” Gord touched his nose and looked at his paw. There was a bit of blood, but he wasn’t finished. “Papa wouldn’t want us to be cowards! We shoul—” Hjat struck him so hard this time he knocked him from the tree. He reached out and caught a branch as he fell. Gord didn’t say anything more after that. The other brothers wouldn’t protect him from Hjat. “I must leave,” he told Nyira, as they slept in the trees that night. “Why? Your papa will be back soon.” She envied Gord that fact. At least he had a father who could return. The leopard wasn’t difficult to track. After it had had its fill of Nje, it picked up the carcass and carried it out of the clearing. “Maybe she has cubs nearby,” said Nyira. They moved within the thick canopies of the trees and managed to keep pace with the cat, but Nyira needed to inform Gord of something. “But if she feeds her to the cubs…” She couldn’t say it. “Oh, Gord! I’m sorry.” Gord stayed quiet for a long time. They both remained in the trees. Nyira threw her arms around him. “No! I don’t want you to die, Gord!” She began to sob. Gord climbed to a lower limb and never took his eyes off the leopard. The leopard reached her lair where her cubs awaited the arrival of their meal. The lair was located in the western valley, off a tributary of the Congo River. Nyira liked that there was a rear approach to the cave. The river flowed past it as well. So the leopard wouldn’t have to look for water. “I don’t care if she is waiting.” He jumped to the ground and lumbered toward the cave opening. Nyira had no time to react. Nyira realized that if she was going to help, she needed to leave the trees as well. As she got closer, she saw the leopard crouched at the mouth of the cave. 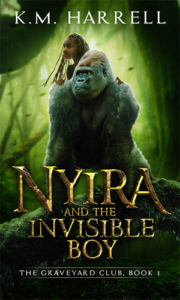 Nyira could sense she was unnerved by the young gorilla’s brazen challenge, and wanted to make sure there weren’t others with him, who might attack her from the rear. Nyira had an idea. She ran around the side of the cave and came over the top, and hid in the brush. Once there, she mimicked the sounds of Gord’s three other brothers. The sounds were so realistic, Gord apparently thought his brothers had actually joined him. This was not what Nyira intended, because Gord got much bolder. “My brothers! Join me!” cried Gord. “Dyil, Hjat, and Biko! Let’s avenge our mother!” He snatched up a large stick from the bank of the river and charged the leopard. “Gord don’t!” cried Nyira. But it was too late. Gord ran up and smacked the confused feline across the face with his club. She swatted him away and tried to run, thinking that others would be upon her. Instead of taking the victory and letting her go, Gord grabbed her tail. This was not a good idea. The leopard spun around and caught him across the face with a vicious swipe. Gord staggered—blinded by the blood in his eyes. But he kept calling to his brothers and swinging the club. He hit the beast a solid blow on the top of her head. He pushed the blood out of his eyes and backed her up to the river, while Nyira increased her echoes and threw rocks and dirt, too—making it seem like the brothers were attacking from the left side of the cave, out of the bush. Gord took the opportunity of her confusion to beat the cat toward the river. Nyira wasn’t sure what he intended. Gord didn’t swim, or at least not that well. That didn’t stop him from pushing the leopard into the water while flailing away at her with his stick. Leopards are usually adept swimmers. Although in this instance, Gord had the advantage. He was upright, and the waist-high water helped blunt the swipes the leopard took at him. Gord was able to land a number of significant blows. Nyira just hoped he didn’t lose his weapon in the water. Otherwise, he was dead. The last blow to the leopard’s skull was so vicious it broke Gord’s club, and the creature didn’t come up again. When Gord emerged from the water, he collapsed onto the bank, and Nyira saw the bloody gashes on his chest and torso. “Gord, lie down!” she said when he tried to get up. She quickly gathered moss to pack his wounds. “Let me help you.” But Gord wasn’t happy. “I failed. I couldn’t get her,” he said, breathless, as he watched the leopard float further out of his reach. “I wanted to take her body back to my papa. I failed, Nyira. It was all for nothing!” He began to cry. “Don’t Gord. Please rest. I’ll find something to put on your wounds, and we can get back to your brothers. Nyira was able to get him to relax then. She left Gord on the bank and went into the jungle to find herbs to put on his wounds. She shouldn’t have left him. When Nyira was returning, she heard the sound of Gord in distress, so she moved quietly and concealed herself in the bush. When she climbed the trees overlooking the bank near the leopard’s cave, she saw Gord tied down by a net and a group of men standing over him, as he struggled to free himself. One of them was the big man from the Mikoni. Nyira didn’t know what she should do. She was afraid of the Mikoni, but couldn’t just leave her friend in their clutches. The big man turned and faced the direction her voice was coming from. “Good day, my little sorceress,” said the man. He was actually smiling. This irritated Nyira very much for some reason. Nyira didn’t speak for a while, as she considered what might happen to her friend. The big man turned to his men. The big man seemed to think about that for a moment. She stayed in the bush and followed as the warriors carried Gord back to his band, in the jungle near her burned out village. Ten-year-old Enriquillo noted that the French soldiers were too encumbered to pursue him. It often puzzled him how the white men expected to be successful in the thick jungle, dressed as they were—every inch of them covered in the tight garments they wore. Add to that, the long fire spear they carried propped upon their shoulders. But the most curious was the thing they wore upon their heads. It sat black and squat like a fat petulant crow and seemed to increase their misery in the dense heat of the bush. Also, when Hurucane showed up, he would take them with him as he raged through the island. Enriquillo was perched high above, within the branches of a Cedar tree, as the troop marched up the trail into the jungle. He had to restrain himself from scampering down the trunk and snatching one of the head things. If for no other reason than to say: This item is worthless! Can’t you see that? Enriquillo used one finger to stroke Taki, his hawk, on the crown of her head. She was situated near his knee on a branch. She didn’t like it when he did that, and if anyone else tried it they would lose part of a finger, but she seemed to understand that calm was required at this moment. Although she did flutter up to a branch above him, and then eyed him suspiciously. He had grown bored with this hide and seek game. But Enriquillo had brought this upon himself. He had snuck onto the Bissett plantation and stolen a prize Arabian colt. It wasn’t a fair trade for his friend, Arak, and Higuamota wasn’t happy when he led the animal into the village cave. “You can’t keep it, Enriquillo,” she told him. “I have to have something, mother,” he replied, as the horse whinnied and pawed the cave floor. “I can sacrifice it. Arak will…” He knew the argument was flawed before he finished. Enriquillo looked at the horse’s face. It twitched its ears and dipped its head as if to say: You know your mother speaks truth. Dejected, he dropped the bejuco tied around the animal’s neck. At that moment, a bat dove from the cave rafters and spooked the colt; it bolted toward the far corner of the cave and disappeared into one of the dark chambers. Enriquillo didn’t feel like pursuing it. “If you don’t go and get it, you will have to replace it,” his mother told him. She went and embraced him. Enriquillo was almost as tall as his mother. Higuamota stroked his forlorn face, and then kissed the flattened forehead that was common among the Taíno people. “You will do it, Enriquillo,” she said. “You must.” She turned and headed toward the front porch of her caney, the customary house of the tribe’s cacique, which she was. Enriquillo decided to go and retrieve the colt instead. He couldn’t yet look at the hole the white man’s fire spear had made, that stopped funny, playful Arak from moving. Enriquillo had waited until nightfall to lead the colt back along the eastern edge of the town. The Bissett plantation was a sprawling property about two miles from the beach. That’s how the white man had spied the two Taíno boys playing in the surf, bringing their boat in from a late evening fishing expedition. Enriquillo was usually very careful. He normally went on these treks alone, because while he was young, he was the only member of the tribe who had invisibility. But there was to be a gathering of the remaining Taíno tribes—decimated and driven into hiding with the arrival of Columbus and the Castilians over three hundred years ago. They were coming out of the mountains to Higuamota’s village cave—so more fish would be needed. Arak had offered to accompany his friend, and help manage the larger catch. They had been frolicking in the waves. Arak had become a stronger swimmer that summer and was racing the boat as Enriquillo paddled through the calm blue water. When they got through the surf, Enriquillo was blinking in and out of invisibility, teasing Arak as they commenced to tug the boat onto the shore. When Arak got into the vessel to retrieve the large haul of fish, Enriquillo heard a small explosion and saw the hole in the boat after his friend fell and didn’t get up. The white man had not seen Enriquillo. He had still been invisible when the man pointed his weapon at Arak. He hadn’t even bothered to come and look at Arak after he’d fallen, but simply turned and strode away, as if all he’d felled was a bird. Enriquillo could only sit and cry as the man walked back through the acres of sugarcane that faced the beach at the edge of the property. The colt did not make a sound as they made their way through the canebrake. Once they were through, Enriquillo found himself in the middle of a massive field of sweet potatoes. The crop seemed to stretch for miles and was a testament to the white man’s wealth. Enriquillo thought that perhaps on his way back, he would pick a few as a surprise for his mother—and then decided that he wouldn’t. Higuamota would ask how he’d managed to pick them when the tribe’s crop was in a valley to the west of the mother cave. The moon and clouds were not cooperating as they had on his initial foray to take the colt. The clouds now receded and the moon caught the white of the horse’s coat and set him ablaze like a walking, four-legged star. Enriquillo panicked a bit when he noticed the effect. He reached down and grabbed a handful of the dark, moist soil and tried to rub some upon the colt, to diminish its glow. The animal wouldn’t stand still for it as if it knew the dirt would take away its luster. Enriquillo finally gave up when the colt reared up in protest. He managed to calm it down and simply walked it quietly through the rows of potatoes. When he got to the edge of the field, they were in the yard behind the stables. The colt could obviously smell the other horses, as it pawed the ground and pranced a bit. You can let me go, now. I’m home. I’m home! it seemed to say. But Enriquillo still had to put the horse back where he had taken him from. He put his hand on the beast’s muzzle, and stroked it a bit, hoping to make it settle down. The trouble started when they got through the front door of the stable. Enriquillo had not considered what the horses already in the stables would do when the colt returned. They began a loud, exuberant ruckus: whinnying and neighing, some of them even pawed the floor of the stables and reared up in excitement, and the colt responded to the energy of its stablemates. Enriquillo realized he should’ve just let the animal go when they were in the stable yard. It was too late for that now. He was then struck on the head from behind. When Enriquillo awoke, he was laying on his side in a stall filled with the grass the white men called “hay.” The strong smell of the horses made him cough, and he had a difficult time sitting up because his hands were bound behind his back. When he finally accomplished it, he saw that another boy was in the stall with him. It was one of the dark people the white men had brought to his land. The boy was thin and had a large scar on his face below his left eye. It was a fresh scar. Enriquillo wasn’t surprised. The Taíno knew the white men were kinder to their animals. The dark boy backed away when he saw Enriquillo was awake. The boy retreated all the way to the gate at the front of the stall. “Massah! Massah! He wake!” cried the dark boy. Enriquillo stopped and looked at the boy. He was shocked. “Massah! Stay from me demon! Massah say you eat eyes!” He continued to try and kick out at Enriquillo. The boy sat precariously on the gate, barely managing to keep his balance. He seemed to consider Enriquillo’s question. The boy just stared at him, as if he didn’t comprehend what he was saying. The boy sat there for a moment, with his mouth open, as if he had something to say, but couldn’t say it. Finally, he slid from the gate and landed on the floor of the stall, and sobbed. Enriquillo sat down beside the boy. “That’s like a Medicine man,” said the dark boy. Enriquillo began to work his shackled hands under his bottom and past his legs until they were in front of him. “No,” replied Enriquillo. “But I did learn a trick from Agueybana. He calls it: Small. I use it when I need to hide in a place I’m too big for. I’ll see if it will work on these.” He closed his eyes and held his shackled wrists out before him. Abiodun saw the shape of Enriquillo’s hands change, and the shackles just slid off. Enriquillo stood up and began to climb over the stall gate. “No. We won’t need to. I’ll lead the dog away. Just head for the cane fields behind the stables.” He climbed over the gate and turned invisible. Abiodun let out a gasp. Abiodun waited. After a short while, he heard the booming bark of the master’s giant bull mastiff; the dog quickly went silent. He wanted to run out and see what Enriquillo had done to quiet the beast but restrained himself. He then heard a familiar chirping, a sound that often floated out over the cane fields as he was bent hacking in the unyielding sun. He was afraid but started moving toward the stable door. The yard was empty when he got outside. Though the moon was still bright and cast an eerie shadow off the stables and onto the front yard—he could see the residence of Etienne Devereaux, the overseer. The house was small and white with a pillared front veranda—a tiny imitation of the masters’ palatial quarters. It was less than thirty-five yards from the stable yard. Abiodun had a notion that cruel Etienne could see him through the front window of his house. He was suddenly gripped by fear and forgot everything Enriquillo had said to him. Where was he? wondered Abiodun. What if he had gone back into the mountains? How could he have trusted his fate to a horse thief? What was he to do now? He realized that all he needed to do was go to the overseer’s house, and say that the horse thief had escaped. They would blame him, of course. He was supposed to keep watch over him. Etienne was quick with the whip. But perhaps they would do something other than the whip. White men were creative in their cruelties. He didn’t wish to die in some of the ways others like him had been killed: feet chopped off and bleeding out, or strung from a tree and gutted like a boar. Perhaps it would be better if he presented himself to master Bissett. Though there was no guarantee that the master would save him from Etienne. Since it was obvious that the overseer carried out his barbarity with the master’s blessing. He was lost, irrevocably lost…but then he heard another sound. So there Enriquillo sat, watching from above. He had taken some of Abiodun’s rags and placed pieces of them in fifty different places around the town. The hounds had gotten very confused. The only legitimate lead the soldiers had was that they knew Enriquillo was Indian and was likely hiding in the mountains. With that knowledge, they began a search of the surrounding mountain valleys. The trail was cold before they started. He just wished Arak was there hiding up in the tree with him. He always knew the right face or the right sound to make him laugh. He hoped to make a friend of Abiodun but knew the white men wouldn’t give up their property so easily.